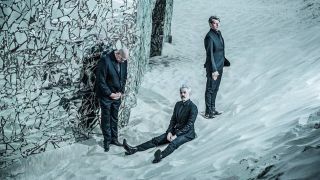 Belgian rockers Triggerfinger have announced that their upcoming album, Colossus, will be released on August 25 on Mascot Records. It’s the follow-up to 2014’s By Absence of the Sun, and is preceded by a video for Flesh Tight, the second track on the album. The video for Flesh Tight is also quite… fleshy. And it features a gang of marauding swimwear models with something of a penchant for sidearms. Following several years of tour dates with the likes of Red Hot Chili Peppers, The Rolling Stones, Within Temptation, Thin Lizzy, Clutch, Big Sugar and Therapy? and an in-ring performance at Vladimir Klitschko’s heavyweight title defence against Tony Thompson in 2012, the band needed to take a step back. Colossus was produced by Mitchell Froom and engineered by Tchad Blake, who’ve previously worked with the likes of Los Labos, Elvis Costello, Paul McCartney, Bonnie Raitt, Richard Thompson, Tom Waits, Arctic Monkeys, The Black Keys, U2, and Pearl Jam. Triggerfinger are playing some festival dates this summer (see below).